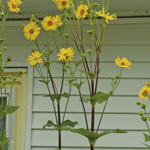 This long bloomer provides quality bird seed from Aug to Nov. Use with summer flowers that are purple. I am in love with my ox-eye sunflowers. They are not at all like the sunflowers most people think of, but wonderful all the same. I have gotten profuse blooming from just 2 or 3 plants that I started a year ago. I might be able to stake them, but instead let them bush out. I notice at the beginning of the season I need to water them a lot, but once they get underway, I hardly have to water at all. They are long-lasting and make a beautiful showing. I rescued my plants from the throes of the ditch digger in rural Clinton county. 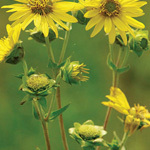 They have thrived everywhere in full to part sun as long as they get enough moisture. Since they are shorter than the annual sunflowers, I grow them in pots on the patio. This lures butterflies! 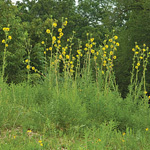 They also seem to be be great companion plants with other wildflowers and native grasses. 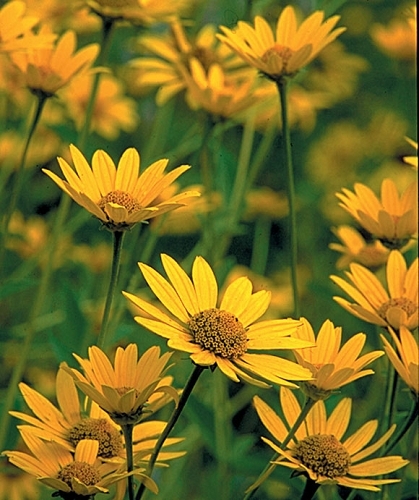 Heliopsis helianthoides is a great perennial, especially where you need that burst of yellow! Ox Eye produces fantastic long lasting blooms for many weeks. The bright yellow flowers can be seen from far away. Very hardy and healthy, they will produce many blooms in the first year. I highly recommend it!